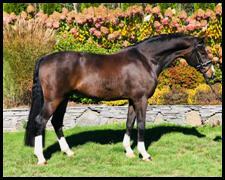 Both “Dressage and Eventing” Consignment horses are welcome! Let us sell your horse. We offer consignment programs, for a limited number of pre-qualified horses. To see if your horse qualifies, please Contact Us. Selling a horse can be difficult and time consuming especially if you have never done it before. Between horse preparation, marketing, fielding phone calls and dealing with no-show potential buyers, selling a horse takes a considerable amount of time and energy. Consigning a horse can reduce these issues plus decrease stress and the emotional impact when selling a horse you love. The BRF staff will handle the horse’s preparation, marketing, sales video, and representation of your horse so you can be sure they are looking their best for prospective buyers. In addition, BRF will handle all details of the sale contract and transportation of your horse to its new home. BRF consignment horses are usually listed for sale within 30 days of their arrival. During the first 30 days, the horse is ridden and assessed, marketing data is collected, sales pictures are taken, marketing video is produced, X-rays are taken, if current radiographs are not available, and the sales price is determined. We recommend posting the sales add in 3-4 different marketing sources for maximum coverage. Our average selling time, after being listed for sale, is 45 days. The owner is responsible for the consignment fee of 10% of the sales price. In addition, owner pays all farrier and veterinary fees, advertising costs, and transportation costs as needed. A health and soundness exam may be required prior to acceptance into the program. 10% Commission payable upon sale of the horse. With a passion for coaching and teaching, successful 3-star event rider, Mary Burke has helped guide rider’s paths to success for over 20 years. Due to her expanded knowledge based in human physical therapy and her extraordinary ability to clearly explain the “Art of Riding,” she can assist competitive and non-competitive riders of all levels. “ I have spent 25 years educating myself on the art of teaching. You have to have expanded teaching methods to help physically challenged patients regain the ability to walk, relearn functional physical tasks or re-strengthen damaged muscles in physical therapy. I use these same teaching techniques to help riders obtain a clear understanding of how to improve and learn new riding skills.” Mary’s philosophy of teaching people in the hospital clinic or in the riding arena is; “People have to SEE, FEEL, SAY, and then DO, what you want them to learn. 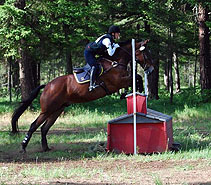 By using these 4 different techniques of learning, student’s gain a deeper understanding of the task and this accelerates the learning process.” Caring deeply about the process and coveting the ability to uniquely teach all ambitious riders, Mary not only wants to be known as a trainer, coach and mentor but genuinely wants to share her knowledge with others interested in learning the art of riding. Read more about Mary on our About Us page. Communication is a huge part of my training philosophy and allows each person, no matter their skill level, to understand how the horse thinks and how to better communicate with their equine partner through simple horsemanship tools and techniques. 3-Star rider Mary Burke provides Dressage, Stadium Jumping or Cross Country lessons in 45 minute lesson blocks. You are welcome to haul-in for one lesson or come for several lessons over a long weekend and stay at the facility. Burkeridge Farms provides an online calendar option so you can view the Burkeridge Farms schedule on your own computer. See the Burkeridge Farms lesson calendar on our Home page. My riding has improved dramatically under Mary’s instruction. Mary is very good at helping me and my horse overcome problems and improve my confidence. Mary is good at describing and demonstrating what position my body should be in. With her instruction I have become braver about jumping. I qualified for the State 4H Fair in Puyallup in dressage and jumping with Mary’s help. In preparing with Mary for state I was awarded Grand Champion Dressage in intermediate training level at the 2010 4H State Fair. I started taking my 7 year old to Mary for lessons a year ago. I originally choose Mary because she loved teaching kids. What most impresses me about Mary is how she can fix a problem you have been struggling with for months in a matter of minutes. My daughter's lessons went so well I started training at Burkeridge Farms with Mary as well. We drive over 1 hour each way for lessons with Mary but it is well worth my time and the extra gas. Yes, I could take lessons much closer to home but I would have to take several lessons with another trainer to learn what I learn with Mary in one lesson. Taking a lesson with Mary is a great experience! She is professional, detailed and tuned in to the smallest changes that are being achieved and communicates her instructions clearly and concisely while maintaining a sense of fun and exuberance that is highly motivating. Mary’s expertise in human anatomy is extremely helpful to me in understanding my riding and what it is that I need to accomplish in order to help my horse. My daughter and I have learned a ton and look forward to achieving some of our goals this year with Mary’s help! My daughter has riding with Mary Burke for many years, starting as a very young child. The years of instruction have been always positive and in additional to the incredible riding skills she has been able to gain she has gained a lot of skill in horse management, show presentation, and great work ethic and marked improvement in her communication skills. My daughter trust Mary and greatly values her knowledge and opinion. Mary is great about making improvements at every single lesson and giving her the drive to want to improve and work diligently on her riding as well. I definitely see huge benefits to the positive instruction in my daughter not only in her riding but how she is with other riders and people in general. Mary herself is not only a great instructor but rider herself with amazing position and skill at the upper levels. Download all fees and services. Download our rider release form. I have a passion for training horses. “Part of the excitement of training is getting to understand the horses personality and learning style. Each horse responds differently and brings a different history with them when they come to BRF. You have to understand how they emotionally respond to the riders aids so you can optimize their learning”. The horse training schedules we design are flexible. We can provide individual professional training sessions or month-long training programs that are focused on the horse's specific needs. We prefer to finish the horse's training with a blend of owner lessons and professional training days so the horse and rider can come together for optimal success before going home. Horse safety and horse health is our top concern at Burkeridge Farms. We keep a knowledgeable eye on our horses 24/7. We also rely on our trusted barn maintenance staff who are well acquainted with the idiosyncrasies of each horse to alert us to any changes in their emotional, nutritional or physical status. As a boarder at BRF you may ride your horse in any of the 3 available arenas. You may choose to school your horse in the 120’ X 220‘ outside jump arena; trail ride on the groomed paths around the hay fields; or spend time in the large dressage arena or remain in the 70’ X 170‘ indoor arena where lights, custom footing and mirrors allow for optimal training opportunities. Stabling consists of 12’ ft x12‘ ft. box stalls that walk out into 70’ x 95’ foot sand paddocks. Each paddock has a sand/pea gravel mixture to reduce mud in the Spring time. These airy wooden stalls have high rooflines for maximizing airflow. Each stall has a heated automatic waterer and automatic lights for horse and owner convenience. BRFʼs custom grown premium quality orchard grass hay is included in the standard monthly board fee. Horses are fed twice daily. Ample storage and large tack lockers are provided in BRF’s beautiful tack room were clients can sit and visit or clean tack in a relaxing and clean environment. Burkeridge Farms is my riding sanctuary. The farm is unique in the way that it has the close feeling of family, while providing the rider with all the professional amenities one could ever want. Burkeridge Farms is a place that any horse would be lucky to call home. Mary and Richard plan and work on their goals of having a top notch training facility and it shows. Each season brings new changes…better footing, another arena, more jumps, great shelters for the paddocks, parking area improvements, drainage, to more storage for the boarders. The barn couldn't be cleaner or more organized yet Mary is always working on making it better! Stable management reserves the authority to address issues of horse safety, management of horses, clients and personal visitors. While a client specific boarding location preference is considered, individual stalls and corrals are not the property of the client, and the horse may be reassigned when behavior or health needs dictate. View rules here. Owners are responsible for hiring and scheduling timely visits with their respective farriers. Your farrier should bill you directly. If you would like information on farriers in the area, we will be happy to pass along names and phone numbers for your convenience. Horses under full training will have farrier services managed by Mary Burke as part of the training program and farrier will bill client directly. Mary Burke utilizes Rick Hall from Silver Shoe Supplies to keep all her horses moving their best.